Dubbed as “the audio interface guitar players were waiting for”. Following its Sampletank 4 launch, IK Multimedia is targeting guitarists with its latest release: the AXE I/O interface/controller. This device is kitted out with top-of-the-line recording components which are designed to capture your guitar’s sound in its most organic form. It also doubles up as an intuitive software controller – that is handy for performing live – and is stacked with a massive plug-in section. Achieving a faithful digital recreation of your six-string’s tone can be a challenging. The AXE I/O aims to resolve this issue with some newly designed components. At the input section is a patent-pending Z-Tone impedance adapting circuit. This feature lets you tweak the AXE I/O’s input impedance, enabling it to better interact with various electric and acoustic guitar pickups. Additionally, the device features an active mode – engaged by a pickup selector – that bypasses unnecessary gain stages that by active pickups produce. 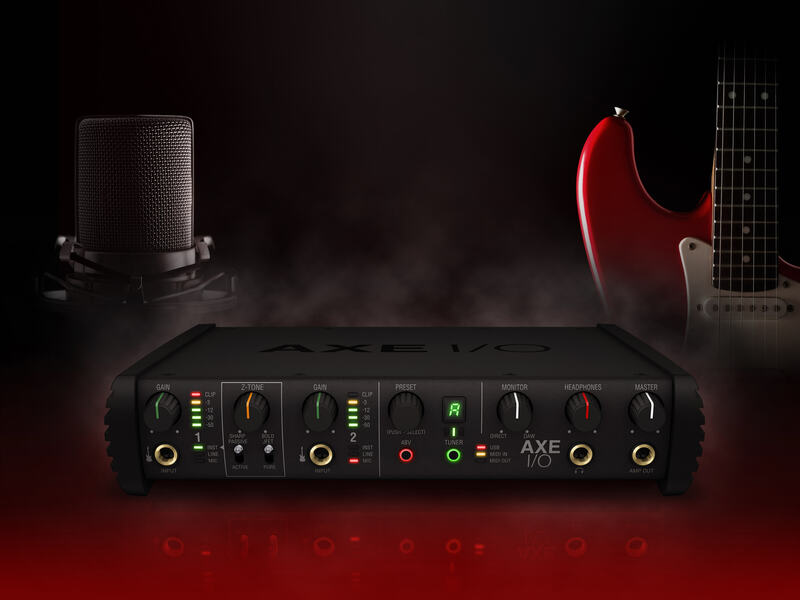 Guitar and bass players will also savour the AXE I/O’s streamlined re-amplification setup. With this in play, you can easily integrate your actual gear into the recording setup without the typical interferences or hum. At the device’s front panel, you’ll find two Hi-Z 1/4-inch inputs that are specifically designed for guitars and basses. To ensure that your instrument recordings are captured in the highest fidelity, the AXE I/O is equipped with a 24-bit, 192 kHz conversion rate and an ultra-stable, low-jitter internal clock. The AXE/IO can also be utilised as an intuitive software controller: just hook up the right connections to its two rear controller inputs. However, the device really shines during live performances. An assignable data knob (with push encoder) lets you switch between presets and control the AmpliTube software in real time. If you still can’t find the tone you want, the AXE I/O has a massive selection of software and plug-ins to choose from. These include options from IK’s AmpliTube 4 Deluxe – the acclaimed guitar and bass tone studio – and a catalogue of 10 popular processors from T-RackS 5.